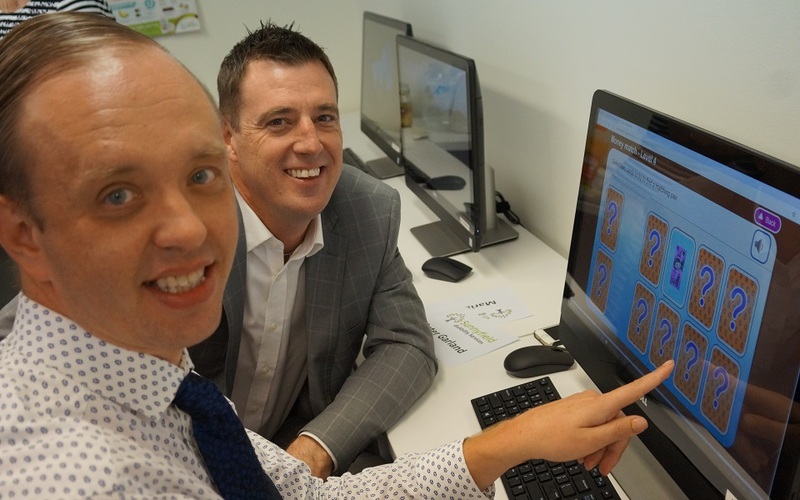 Sunnyfield welcomed Mayor of Northern Beaches, Michael Regan for the official launch of Sunnyfield’s Skills for Life programs at the Frenchs Forest Community Services Hub on Thursday 18 January. Sunnyfield received a grant as part of the Stronger Communities Fund (a one-off NSW Government grant set up to provide funding to newly merged councils to help kick start projects that improve community infrastructure and services). The funding enabled four Sunnyfield Community Service Hubs (Frenchs Forest, Parramatta, Marrickville and Bexley) to purchase IT equipment and other resources to increase opportunities for people with disability to participate in the Skills for Life program. The technology removes some of the barriers people with intellectual disability have in accessing learning opportunities i.e. being able to read and write. Sunnyfield’s suite of Skills for Life programs have been designed to support people with disability to develop and strengthen communication and problem-solving skills, increase self-awareness and build capacity and independence. We recognise the need for lifelong learning and the skills developed as a result of these new activities have been life-changing for many of the clients we serve.” Caroline Cuddihy, Sunnyfield’s Chief Executive Officer. If you would like to find out more about Sunnyfield’s Skills for Life programs please contact 1300 588 688 or click the button below to find out more.